Whether you're a fan of fine art, enjoy honing in on history and culture or are simply excited to mine galleries for exquisite treasures, Anchorage has plenty to offer. For many, a catch-all jumping-off point is the Anchorage Museum, located at 625 C St. In recent years, the museum has grown and modernized. Its resulting Alaska Native galleries are stunning – rows of displays showcase the unique and incredible culture of Alaska's first people, with touch-screen stations where the curious can peel back layers of displays and information to delve deeper into the exhibit. You'll find delicate baskets woven from slender grass blades, durable and incredible clothing made of animal skins and furs and intricately beaded pieces and artifacts dating back to long-ago times. This gallery showcases the inimitable durability and style of Alaska Native cultures. The Anchorage Museum also includes the newly remodeled Art of the North exhibit. Spacious gallery bays provide ample space and light to view classic paintings of some of Alaska's most breathtaking scenery. The most recent remodel also saw the redesign of the Alaska Exhibition. 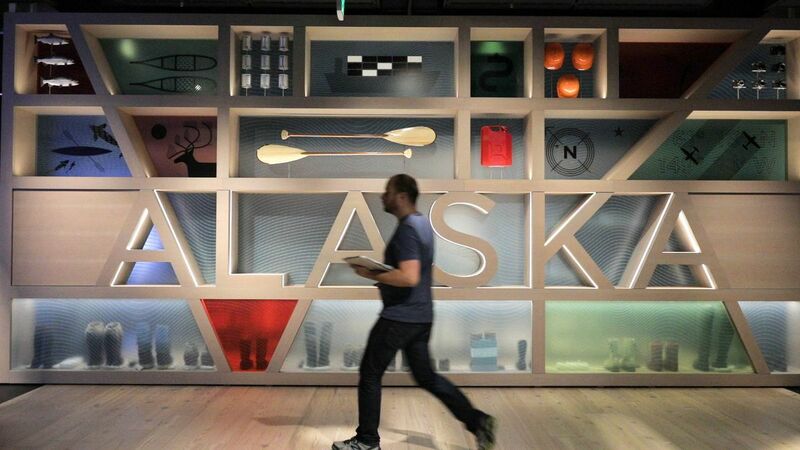 The new space uses stunning visuals and inventive technology to convey the combination of culture, history and ingenuity that created the Alaska we know today. The museum also maintains a lively area for family classes and youth activities. Outside the downtown is the venerable Alaska Native Heritage Center, an indoor and outdoor complex that celebrates and educates visitors about the unique and incredible legacy of Alaska Natives in Alaska. The center covers some 26 acres, located northwest of the Glenn Highway and Muldoon Road. Many visitors will be surprised by the broad range of Native cultures and traditions, and the Heritage Center is an extraordinary chance to see it all in one place. The Welcome House celebrates contemporary Native traditions, while the recreated village sites on the property offer a glimpse of more traditional ways of life and are set up for visitors to explore. The Anchorage Museum and the Heritage Center are the two biggies in town, but are complemented by other cultural centers that address both broad and specific interests. The 1964 Good Friday Earthquake changed Alaska, and at the Alaska Experience Theater, an ongoing and experiential show dedicated to this violent episode continues to dazzle visitors. The seats literally tremble and shake as moviegoers absorb this intense theatrical experience. It's the best way to get a sense of the devastation and subsequent recovery brought on by the great quake. Also downtown is the Fraternal Order of the Alaska State Troopers Alaska Law Enforcement Museum (245 W. Fifth Ave., Suite 113). Admission is free, and the museum is open 10 a.m.-4 p.m. weekdays and noon to 4 p.m. Saturdays. This niche museum houses the state's only collection of historical law enforcement memorabilia, including an authentically restored 1952 Hudson Hornet automobile. The museum also sports antique radios, handcuffs and leg irons, early wiretapping equipment, old photographs and documents and Alaska policing uniforms. There's even a gift shop with Alaska State Trooper memorabilia and souvenirs. Over on Anchorage's east side is the Alaska Museum of Science and Nature (201 N. Bragaw St.). This museum is focused on the unique science of Alaska, from prehistoric times to present. That includes the state's unique geological, cultural and ecological history. The museum is open from 10 a.m. to 4 p.m. Thursday to Saturday. Museums in Anchorage are sometimes found in unusual places. Case in point, the Alaska Heritage Museum located in the Wells Fargo building in Midtown (301 W. Northern Lights Blvd.). The museum highlights Wells Fargo's history in the Alaska Gold Rush era, including an almost-to-scale stagecoach. Beyond that, this enormous private collection includes fine Alaska art, hundreds of Alaska Native artifacts and remarkable paintings by Alaska's masters. Just before the airport is the Alaska Aviation Museum (4721 Aircraft Drive). Among the city's top attractions, this original museum includes artifacts and relics of Alaska's incredible history that will delight history and aviation buffs. There are more than two dozen vintage crafts on display and also outdoor exhibits. Talk about ambiance, this museum sits shoreline on Alaska's Lake Hood, a bustling seaplane base. Visitors have one last chance – make that two last chances – for arts and cultural immersion at Ted Stevens Anchorage International Airport. First, on the lower level is the Alaska Sports Hall of Fame. This ever-growing exhibit celebrates Alaska athletes and sporting events, paying homage to some of the state's greats. A few names will ring bells with visitors from the Lower 48, but most will offer interesting peeks into Alaska's unique sports culture, a world punctuated by dog mushing feats, occasional Olympians and local advocates for athleticism. Second, just past security and on the airport's top level is a display of Alaska Native art, a peaceful alcove where visitors can soak in beautiful creations unique to the 49th state before their northern adventure draws to a close.